Harry Houdini Miniseries Trailer Is Here!!! When your life is full of intrigue, mystery and espionage you can bet someone in Hollywood is going to find a way to tell that story. This is exactly what happened with the life of Harry Houdini. Nearly 90 years after his death the details surrounding his life is still drawing enough attention that History Channel is getting ready to air a 2-night mini-series titled ‘Houdini‘, short and to the point. 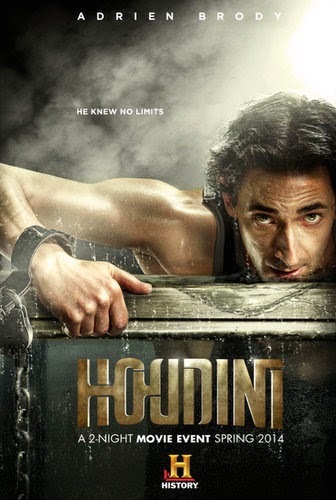 Adrien Brody stars as the legendary illusionist, with Kristen Connolly as his wife Bess. We will see the sordid and fantastic points of his life from the roots of his fame to the battles with spiritualists and all high points in between. Tom Benedict Knight and Eszter Onodi fill out the top billed cast. Nicholas Meyer scripted the mini and Uli Edel brought it to life from the director’s chair. If you’re thinking to yourself this could be good, but I wish I had more to go off of, you’re in luck. I’ve got the trailer. I know, I’m awesome, right? Part 1 of ‘Houdini‘ will air on History Sept. 1, with the second part airing Sept. 2. Who else is excited for this besides me? We’ve Got Your First Peek At Jude Law In ‘The Young Pope’!!! BoJack Horseman Season 4 has a Trailer! Netflix’s ‘The Crown’ Debuts Season 2 Trailer!!! This entry was posted on Monday, August 11th, 2014 at 3:30 pm	and is filed under News, Television. You can follow any responses to this entry through the RSS 2.0 feed. You can skip to the end and leave a response. Pinging is currently not allowed. « Sequel to TMNT Announced!! !